Creating sanctuary schools for our students and families cannot wait, especially in the current political climate in which the President is threatening increased harassment and deportation of undocumented immigrants. 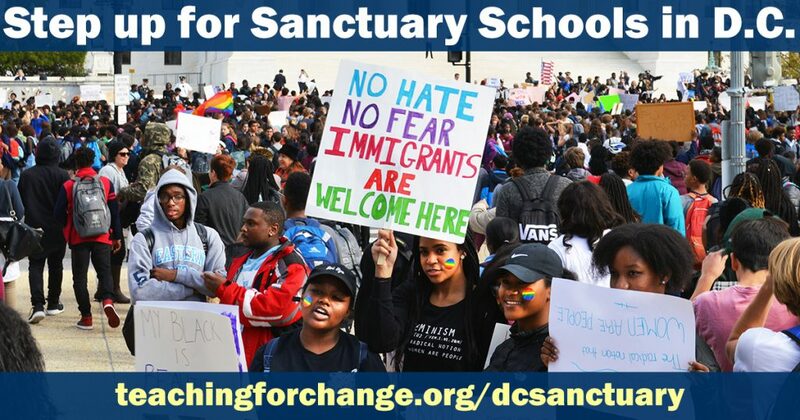 The inaction by D.C. officials on the sanctuary schools proposal means that we as a community must take action where our officials are unwilling to do so. We – parents, community members, students, and educators – must directly advocate to our school leaders to create safe zones and adopt sanctuary school policies. 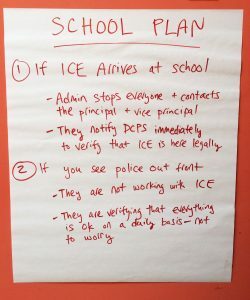 A DCPS principal created a protocol for staff in the event that ICE agents come to the school. 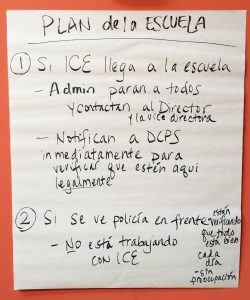 The protocol closely follows our recommendations for DCPS and includes directing ICE agents to the front office while school leadership contacts DCPS Central Office. The principal informed staff and families of the new protocol as part of efforts to support and reassure the school community. Another DCPS school established a committee to secure attorneys, provide support with legal fees and documents, and help immigrant students and families access community resources. The committee raised more than $8,000 after learning that families in the school had received deportation orders. Capital City Public Charter School formally adopted a Safe Zone policy in March 2017, following the model resolution proposed to D.C. Mayor Muriel Bowser and other education officials. The Parent Centers in Teaching for Change partner schools and others throughout the city continue to support parents with immigration and know your rights workshops that are highly attended. Do you have an an example to share? 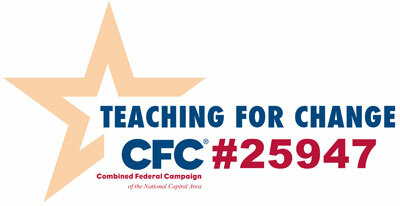 Please send it to ts@teachingforchange.org. Contact the principal or leader of your school and urge them to take action now. Share the examples above and the model sanctuary school policies for your school to develop a plan of action. Teachers want city and school district leaders to reaffirm our schools as sanctuary spaces that will provide all students, regardless of immigration status, access to a safe, free public K-12 education. Sanctuary policies and procedures support all members of the school community. Teachers must have the freedom to address immigration policies with our students in age appropriate ways because we know that the productivity of the learning environment improves when the pressing concerns of students can be addressed. When our lessons are connected to the lives and lived experiences of our students, they are memorable and useful for helping students to critically think about and solve real world, relevant problems.